Fifteen-year-old Shifty knows all about moving around and next to nothing about where he came from. When he's assigned to a new foster home and family, he tries hard to keep cool and stay out of trouble. But it seems like the more he tries to do the right thing, the more trouble he finds. As Shifty navigates a series of messy summer adventures, he struggles to find a balance between the street-wise spirit that has helped him survive and his longing for a place to call home. Lynne E. Hazen has created a fast-paced, page-turning plot full of surprises and warmth. Lynn E. Hazen, M.A., M.F.A., writes books for children and young adults filled with humor, heart and hope. Kirkus Reviews praised her young adult novel, "Shifty," as "a realistic story that resonates. "Shifty" was chosen for VOYA s (Voice of Youth Advocates magazine) Top Shelf Fiction, as a CCBC Choice, and as a Smithsonian Notable. Lynn's books for younger readers include: "Cinder Rabbit," the "Amazing Trail of Seymour Snail," "Buzz Bumble," and "Mermaid Mary Margaret." Lynn earned an M.F.A. in Writing for Children & Young Adults at Vermont College where she won the Houghton Mifflin Scholarship. She also holds an M.A. in Education from San Francsico State University and a B.S. in Applied Behavioral Sciences from U.C. Davis.Lynn lives in Northern California and enjoys giving presentations at schools, libraries, conferences, and literary events. She teaches classes in Writing for Children & Young Adults at Stanford Continuing Studies. Check her website for a free downloadable teacher s guide, a cool "Shifty" Card activity (with free pdfs & how to video) and more. www.ShiftyTheBook.com http: //www.shiftythebook.com/> "From the Hardcover edition."" "Smart writing and an engaging narrative keep the story fresh, while an interesting plot will keep readers turning the pages." "Surprising, inspiring and outstanding titles for youngsters and the grownups that read to them." "...the characters have warmth, and readers will feel empathy for this makeshift family." "...An engrossing and heart warming story; this book draws the reader in from the first page. Shifty tells his story in his own words, which are often humorous and heart-rending and he makes the characters in this tale come alive..."
"In deceptively straightforward prose, author Lynn Hazen brings Shifty's San Francisco world to life on the page. 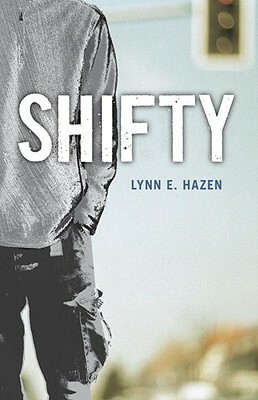 Original, telling details, a compassionate eye, and Hazen's intuitive understanding of how love and trust can save us make Shifty a book to treasure."